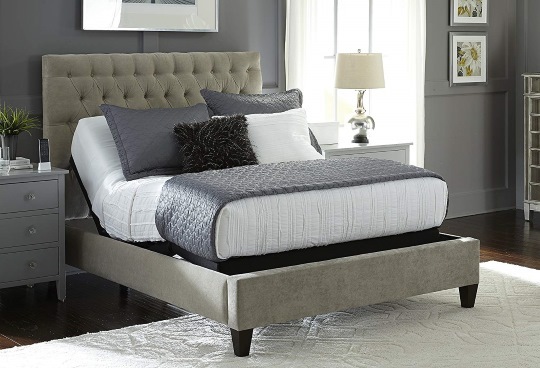 The Prodigy 2.0 is the most affordable of Leggett and Platt’s premium adjustable beds. It is getting very good reviews and owners seem pleased with their purchase. The Prodigy 2.0 comes with a host of great features including wallhugger technology, multiple built-in USB charging ports, an Apple and Android app, a massage feature, three movable bed sections, under bed lighting, and more. Also, the Prodigy 2 is built in the USA by American workers. The Prodigy is sold by some retailers as a bundle with a mattress or mattresses. 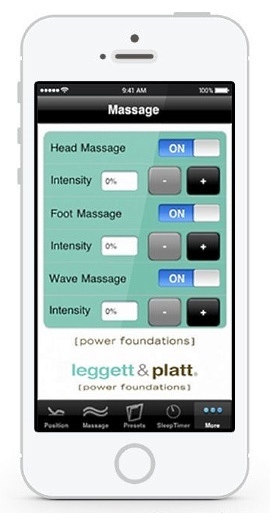 The mattresses are not manufactured by Leggett and Platt but are typically chosen as a good fit for the adjustable bed. One very good example of this can be found on Amazon. This is the Leggett and Platt Prodigy 2.0 combined with Nature’s Sleep memory foam mattresses (Queen size example shown below). This bundle is the most popular Leggett and Platt bundle on Amazon (by a significant margin) and as such we refer to it frequently in this review. These consumer ratings are very good and make this combination worth consideration. However should you wish to purchase the Prodigy 2.0 without any mattress then you can find it here. As the consumer ratings indicate, most owners are pleased with their adjustable bed and we see many positive comments such as “a great buy”, “very comfortable”, “I would purchase this again”, “recommended”, “extremely happy”, “the prodigy 2.0 is amazing”, “awesome bed frame”, “great bed” “excellent quality”, “I could not be happier”, “worth every penny”, etc. Folks report that the bed moves smoothly and that the motors are quiet. Also, there are a host of comments related to how easy it is to operate the bed. 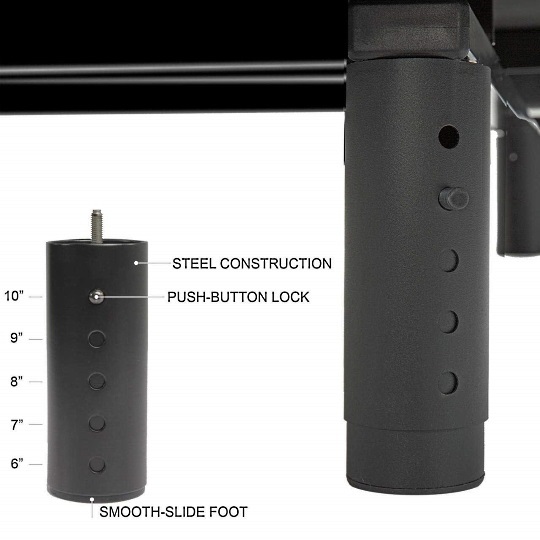 The remote has simple and intuitive controls and the App adds even more functionality. The under-bed lighting feature is also very popular. The feature helps when the room is dark and you need to get out of bed, and it doesn't result in disturbing your partner. The lighting can also be controlled by the remote or the App. Should you buy the bundle on Amazon you will be able to order white glove service from Sleep Geekz (more on this later). What we wish to highlight here is that this service is available and that customers have been very happy dealing with Sleep Geekz. Other positives reported by owners include the split king feature (whereby each side of the bed can be controlled independently from the other), the bed position memory settings, the very sturdy bed frame, the snore setting, the fact that the bed has 3 moveable sections (as opposed to the more typical 2), and that folks with back pain have reported an improvement in symptoms. On the downside, the unit has no castor wheels so moving it is difficult because it is rather heavy. 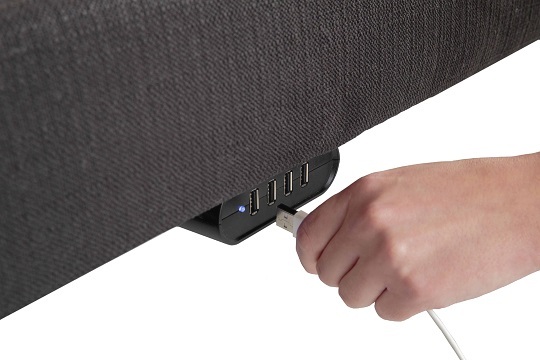 We've also seen a few comments about the built-in USB ports not always working. In addition, while most people like the Sleep Number mattresses provided in the package, there are a number of folks who have found the mattresses too firm - especially the 10 inch mattresses. Fortunately the mattresses do not seem to sleep hot. You can read more Prodigy 2.0 owner comments on Amazon. J.P. Leggett and C.B. Platt formed their business in the late 1800’s in Missouri. They introduced the Leggett and Platt spiral steel coil bed spring in 1885, and the business was incorporated in 1901. The company has continued operating in the USA to present day. The company has been building adjustable bed bases for over 40 years and they are sold at large retail outlets as well as online. Few, if any, adjustable bed manufacturers have been around as long, and some have come and gone. This is especially important when you need replacement parts – which can happen with any adjustable bed after 5 or 10 years. If the manufacturer is overseas or does not exist anymore then you have a problem. With a Leggett and Platt adjustable bed you can find parts for a 25 year old unit and you can get them quickly. This is no small thing, especially for such a significant investment. Also, Leggett and Platt adjustable beds used to sell under the name CraftMatic, and they continue to provide adjustable beds to Sleep Number. All Leggett & Platt adjustable beds are made in the USA – more specifically in Joplin Missouri and Georgetown Kentucky. The Prodigy 2.0 is available in Twin XL, Queen and Split King. Note that a Split King is actually two Twin XL's. The Prodigy 2.0 has three adjustable sections – head, foot and pillow. Many adjustable beds only have two (don’t have “pillow”). The Pillow tilt feature allows you to adjust your head tilt independently. Also, each section of the Prodigy 2.0 is powered by an independent motor. The leg height on the bed is adjustable. This is an important feature especially if you find that the unit with the mattress sits too high or too low. The ability to adjust the height of each leg and lock it in place goes a long way in resolving this problem. Legs can be adjusted from 6 inches to 10 inches. This varies the height to the top of the bed (not including the mattress) from 14 inches to 18 inches. If you know the height of the mattress you have or are going to buy you can do the math and determine whether this adjustable bed will provide the right height for you. Also, the legs themselves are quite sturdy and have a diameter of 2.5 inches. As you can see, the wallhugger technology ensures that you stay closer to the night table/stand beside your bed by simultaneously sliding you back when you are lifting the head area. This makes the night table/stand accessible at all times. Without this feature you can see that access to your book, glasses, remote or whatever is on your night table becomes very awkward. Many adjustable beds do not come with this feature. The bed can also be controlled by a downloadable App. The App works with both Apple and Android devices, and it provides a host of controls including those on the remote plus a sleep timer setting and a gentle wake-up alarm. 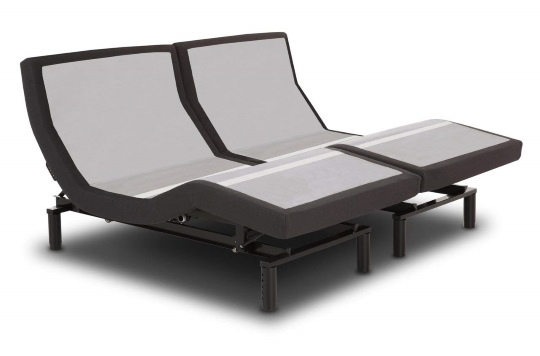 - If you get a split king adjustable bed each side of the bed can be operated independently. - If you get a split king adjustable bed you will also get a Dual Sync Cable which will allow both sides of the bed to raise and lower simultaneously. This would be useful if you have a king mattress (that is not split). Note: I’m sure CertiPUR-US does their job well but bear in mind that this group was put together by members of the global foam industry. Three different heights of mattress are available in several different sizes (with this bundle). The 10 inch mattresses are all "Medium Firm" and this is likely why some (but not all) owners feel the mattress is too firm. The 12 and 14 inch mattresses seem to be a combination of "Medium" and "Medium Plush". If you want to be sure about the comfort level of the mattress we would suggest a quick call or email to the manufacturer or to Sleep Geekz (see below). If you purchase the bundle on Amazon you will likely be getting the product from Sleep Geekz (if not then don’t worry about this section of the review). According to everything we have read, working with this company is a good thing. You can see information about Sleep Geekz on Amazon – including a customer service phone number. The company also offers a white glove service which consumers report is fantastic (of course you have to pay for this). The reason you may want this is because the adjustable bed is very heavy. White glove service typically provides delivery of the product inside the house, setup of the base, and removal of all packing materials. Some say Sleep Geekz is in and out of your house in about 45 minutes. For more details about this we would encourage you to contact them. The company is getting very good reviews for its service (organizing delivery, answering questions, dealing with issues, etc.). Folks are very pleased with Sleep Geekz and that is no small thing – it provides some peace of mind when you are shelling out for an expensive product. We have also read that if you have at your disposal two able bodied men who are reasonably strong, then you may not need the white glove service. 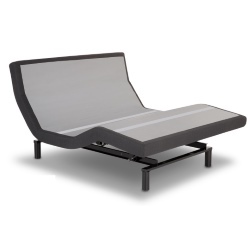 - The adjustable bed uses a microhook retention system. This keeps mattresses from slipping so you don't have to have a mattress retainer bar (but one is included should you want or need it). 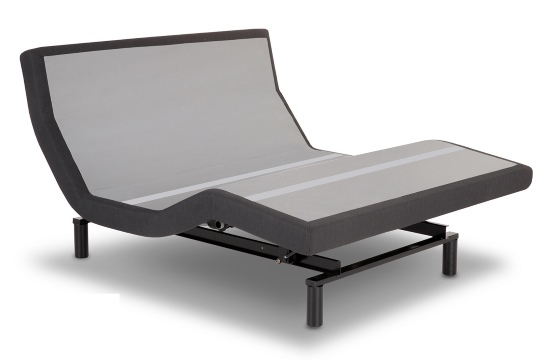 - The adjustable bed works with adjustable friendly bed frames. The Leggett and Platt Prodigy 2.0 carries a limited 1-3-25 warranty. This is the same warranty provided with all L&P adjustable beds. What does 1-3-25 mean? If you want to see the more details about this particular warranty you can view it here (in English, Spanish, French).